partneringONE® is the leading conference networking solution. 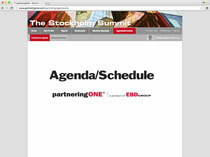 Combining the industry's most advanced web-based collaboration software with best practice implementation, partneringONE turns any conference into a world-class partnering event. The tutorials below are a great way to get started with partneringONE®. They cover the complete life cycle from entering your profile all the way to your finalized meeting schedule. Setting your availability for meetings tells partneringONE when you are and when you are not available for meetings. This tutorial covers the various ways to search for potential partners in partneringONE. Setting bookmarks and downloading your search results into an Excel sheet are also covered. A quintessential function of partneringONE is to allow you to request meetings with potential partners and to accept or decline requests for meetings from others. Learn more about it in this tutorial. Learn where to find your meeting schedule and how to make changes to it. This tutorial explains what to expect on site and how partneringONE helps you stay up-to-date during the event.